It is possible to make beaded jewelry with no special beading tools. If you have wire cutters (or a pair of scissors you don't mind using with wire) and a pair of needle-nosed pliers to help wrap the wire around the closures, you can make a lot of basic kinds of jewelry and other beaded items. There will come a time, however, when you want to rise above the traditional toolbox and get some specialized tools just for beaders. Here are some of the tools you might consider investing in. A pair of pliers that will cut wire and thread is indispensable. Nippers have a short, slightly curved cutting surface that cuts soft wire and other soft materials. If you use hard wires (like memory wire) you will need a different cutting tool, but you are sure to find all sorts of uses for your nippers. Crimping pliers are necessary when working with crimp beads, those little metallic seed beads that can be crimped against the wire to help all the other beads stay in place better. Crimping pliers have a sort of scalloped edge, allowing you to form the crimp with the lower part of the plier stem and form the bead back into a more round shape with the upper part. Much like the name suggests, round-rose pliers have long, rounded parts that are helpful for making smooth loops and curves. Round-nose pliers are needed to sculpt with wire or wrap wire around a bead, but they're also handy for making drop pieces such as for earrings and pendants. These beading tools feature broad, flat tips, which are perfect for straightening crimped or curvy wire. They are helpful for forming sharp angles with wire and also can be used to grip and hold flat objects. You'll probably find uses for these outside of beading projects (such as to help you hold or position something on a scrapbook page). If you work with bead tips, chain-nose pliers (also known as needle-nosed pliers) can help you crimp them closed nicely. They can also be handy for crimping, shaping and bending in tight spaces. Chain-nose pliers can also help you open and close jump rings. Bead design board-If you like to lay out your beads before you start working on a project, a bead design board can be helpful. The board has grooves and measurements that allow you to see what the piece is going to look like before you string a single bead. Bead needles-If you do a lot of work with small beads, you'll probably want to invest in bead needles. Needles work best with fine thread; consult the package of needles for recommendations on which type of thread and beads to use. Supply storage-You'll also need some kind of storage system for both your beads and your tools and other supplies. Some crafters like to have everything in matching containers or all in glass so it can be seen easily. Plastic is a great solution because it's lightweight and cheap, but you can find all sorts of organizers made especially for crafters. Bead scoop-A small bead scoop could be helpful for moving seed beads around your work area. A jump ring opener that can be used with your chain-nose pliers makes opening and closing jump rings and other rings even easier. The following tips can help you choose the best tools and possibly save some money as well. When looking for beading tools, or really any kind of crafting tools, it can be helpful to shop around and see what kits or special deals you can find. You should buy the highest-quality tools you can afford; otherwise you will just end up replacing them quickly. It's fine to buy one tool at a time, but if you can afford a kit , you'll probably get a better deal than you would have if you bought all the tools individually. When looking for tools to help you organize your crafting space, think about what you need to store and how much room you have. Don't limit yourself to the organizers that are found on the beading aisle; there are all sorts of plastic and glass storage options available at the craft store or your local discount store. Of course you will find some tools at your local craft shop, but these are not of the highest quality. However, if you are just venturing into the world of beading, cheaper tools will do the trick. If you have a local store specializing in beads, visit and ask what tools they recommend. They will certainly have a couple of different brands at different price points that they would like to sell you. The advantage of going local is they might have a set of tools you can try out before you buy if you want to work with some wire in the store, and they will be able to answer all your questions. 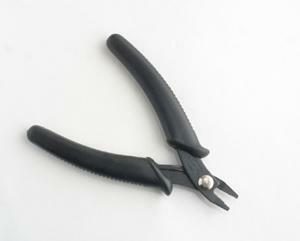 Jewelry Supply has an extensive collection of pliers that are sold individually, as well as a couple of basic kits. This site is helpful because it tells you which items are the economy ones and which are top-quality (if you couldn't tell from the price). Art Beads has some really interesting tools, as well as a light-duty set of pliers color-coded by use in a travel case. Check out the Japanese pliers for a different but useful addition to your tool chest. Auntie's Beads has an amazing selection of tools, which is sure to add to your wish list for tools you would like in the future. From tweezers to reamers, jigs to knotting tools, you will find anything you could possibly need here. Finally, it's important to follow the manufacturer's instructions for the proper use and care of your tools. You want them to last, so use them in the way they were intended to be used. That means don't use your soft wire cutters on hard wire, tempting though it is. With proper care, good quality tools will last you many, many years, so invest wisely and take good care of your jeweler's toolkit.